Several years ago, the draft of a book about the genus Jatropha turned up from the late Albert Pritchard's unpublished work. His wife Daphne entrusted to Pjotr Lawant, Secretary of the I. E. S. and Assistant Editor of Euphorbia World, the finishing of the manuscript. Keeping very much the style of Albert's Monadenium book, this new book is 100 pages in A4 format with numerous photos provided mainly by members of our society as well as drawings from original papers and botanical literatur. The book comprises a short introduction on cultivation, a glossary, an extensive list of relevant literature, a list of Jatropha species and synonyms - and 65 pages full of detailed descriptions of Jatropha species, subspecies and varieties for those interested in succulent and semisucculent jatrophas. The entire text "A monograph about some long existing taxonomic mysteries ... " comprises 208 pages with 79 figuresis. It is available as a pdf file and can be downloaded here. Please note that the size of the file is 8.56 MB. One of the Czech IES-members, Rene Samek, sent us the following information about a Czech Euphorbia book with the title “Pestujeme euforbie”, which can be translated as “Growing Euphorbias”. The authors are Jan Gratis and Jan Nosek. Please have a look into the text to find out more. Althought euphorbias are widely grown in the Czech Republic and have appeared in journals and books devoted to cacti and other succulents since the 1930s, the first book in the Czech language solely about succulent euphorbias was published as late as 2011. 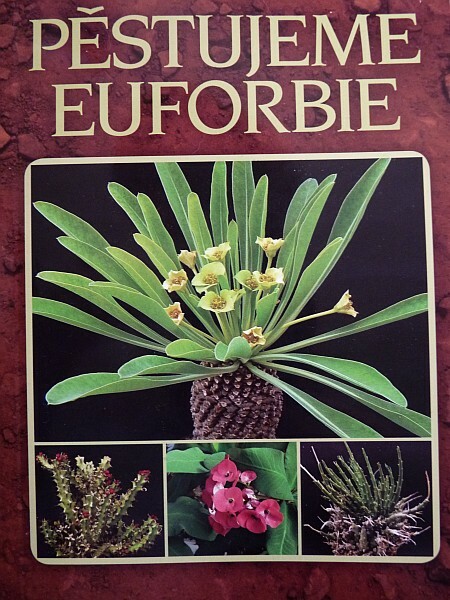 The title of the book is “Pestujeme euforbie”, which can be translated as “Growing Euphorbias”. It is a very useful handbook of 156 pages of text and 146 colour photos aiming at both new and experienced growers of succulent euphorbias. An optional CD-ROM containing more than 500 additional photos which could not be published in the book is also available for purchase. The book starts with the chapters “Description of the Euphorbiaceae family and genus Euphorbia”, “Practical grouping of succulent Euphorbias” (grouping by the form of the stem - columnar, medusoid, spineless, globular, and so on), and “Botanical classification of succulent euphorbias”. Jacobsen´s classification is mentioned in this last chapter but then the classification by Susan Carter, as used in the Illustrated Handbook of Succulent Plants, is described in more detail, with characteristic features of each group and examples of species from each group given). In these three chapters there are inserted 12 drawings of various types of cyathia of succulent euphorbias. Three chapters of text (approximately 10 pages) - “Growing succulent euphorbias”, “Propagation of Euphorbias” and “Diseases and pests of succulent euphorbias” - deal with various topics concerning the cultivation of succulent euphorbias. There is an interesting paragraph in the sub-chapter on propagation by cuttings which describes the methods of rooting Euphorbia cuttings in small glass jars with a small amount of clean water (daily checks are necessary to ensure that the water never dries out). This methods reportedly works very well for rooting thin branches of medusoid euphorbias. On the other hand, the authors say the method had not been tested on cuttings of more than approx. 1 cm in diameter and suggest that such cuttings should better be rooted in the usual, dry way. The chapter “Profiles of selected species” is the major chapter of the book, spanning more than 90 pages. It is divided into 19 sub-chapters according to the classification described in the chapter “Botanical classificaction of succulent euphorbias”. Each of the 19 groups as proposed by Susan Carter is introduced by a short description of the group’s characteristic features. This is followed by profiles of selected species belonging to that group, and an alphabetical list of the species in the group. Profiles of selected species vary in length - from several lines to nearly half a page - and encompass also useful information on conditions under which the species grows in the wild and on cultivation of the species. Euphorbia pulcherrima, the popular plant sold in flowers shops and supermarkets each year before Christmas, [it is called Poinsettia in the UK] got its own three-page chapter called “The Secret of the Christmas Star”. The authors condemn the habit of throwing out the plant to the garbage bin after Christmas, as soon as the top red leaves change their colour to green, and provide advice on how to grow the plant properly so that it will flower again during the next winter. If grown properly, the plant can last more than 20 years, the authors claim. The chapter “Explorers in the Kingdom of Succulent Euphorbias” contains short biographies of Susan Carter, Leslie Charles Leach, Nicholas Edward Brown, Ferdinand Albin Pax, Werner Rauh, and Peter René Oscar Bally. An interesting and new information for me was that F. A. Pax, who described so many Euphorbia species from Africa, was born in the town Dvůr Králové nad Labem which is in the Czech Republic (at the time when Pax was born, the then Czech kingdom was a part of the Austrian Empire). Pax would perhaps be glad to know that there is an active cactus and succulent club in Dvůr Králové which issues a large offering of seeds and seedlings of cacti and other succulents every year. I am aware of another historical connection between succulent euphorbias and the Czech Republic which the authors of the book presented here do not mention - this concerns P. R. O. Bally and is the subject of another article. The next chapter, “What is IES?”, is really a short one, less than half a page, but it contains very important information on our International Euphorbia Society and our journal. The last three chapters are the “Dictionnary of terms”, ”List of literature” (which contains also addresses of three websites), and the “Index”. Names of the plants which have their profile in the main chapter of the book are printed in bold. The photos supplement is inserted approximately in the middle of the book and presents nearly 150 photos of succulent euphorbias on 32 pages. All photos are of cultivated plans - there are no pictures of plants in habitat. Few photos feature relatively young plants (E. royleyana, for example) but most show nice adult specimens. These photos plus many other photos (all together more than 500) which could not be printed in the book because of space limitations are on the CD which can be purchased from the authors only (it cannot be purchased in normal bookshops). The CD also contains photos of hybrids and cristate forms of succulent euphorbias, an alphabetical list of all succulent euphorbias with the number of the group to which they belong, and photos of succulent euphorbias from private collections and nurseries in the Czech Republic and other EU countries. Some of these photos have a tag with the name of the plant(s) but many do not. 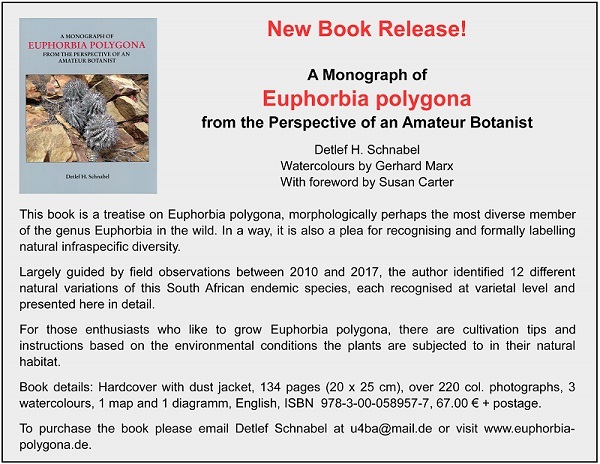 Also included are pdf versions of five articles from the Euphorbia World. Jan Gratias is a biology teacher and a well-known author of books and articles on succulent plants. He has authored or co-authored 10 books on succulents (2 have been translated into German, French and Dutch), as well as books on Geraniums/Pelargoniums and Tillandsias). He has been a member of the executive committee of the Czech Society of Cactus and Succulent Growers and a member of the editorial board of its quarterly journal Kaktusy. He was a founding member and long-time chairman of the Succulent Section - a Czech association of growers of the "other succulents". Jan Nosek is an experienced grower of succulent euphorbias living in Prague. He started growing cacti as a boy, but since the mid-1980s has been concentrating on succulent euphorbias only. His collection of more than 400 species of succulent euphorbias is probably the largest in the Czech Republic. The book and the CD are very useful and have been very well received by succulent enthusiasts, as far as I can judge from various (Czech) blogs and websites devoted to succulents. With the help of the automatic web-based translators (see for example http://translate.google.cz/ for automatic translator from Czech to English and German) even foreigners will be able to enjoy the text. The photos in the book and on the CD are, of course, understandable to all. The only criticism about the book is that photos in the photo supplement are not arranged in alphabetical order but by the group, as in the chapter ”Profiles of selected species”. This makes sense, but as it is not mentioned anywhere in the text it took me a couple of months to figure this out. Before I realised what the logic of the photo supplement was, I thought the photos were arranged at random. As the photo supplement is not indexed, I made my own index of the photos and wrote the number of the page in the photo supplement in pencil in the Index. The book costs about € 10 without the CD and € 12 with the CD (I strongly recommend buying the CD too, it is worth it). If you are not able to purchase it through the usual dealers of books on cacti and other succulents, contact one of the authors at gratias@iol.cz or me at renesamek@hotmail.com. Some members of the I.E.S. will perhaps remember the book “Born Free” on the tame lioness Elsa who was raised by the wife of a game warden in Kenya. It was quite a popular book in the 1960s and 1970s and was made into a film in 1966. You may wonder why I bring up this subject here. The reason is that the author of the book, Joy Adamson, was married to the botanist and Euphorbia specialist P. R. O. Bally from 1938 to 1944. She also was a painter of animals, indigenous Kenyan tribes, and, most importantly for us, east African plants. Joy, whose original name was Friederike Victoria Gessner, was born in the town of Opava (then Troppau) which is in the Czech Republic today. In 1910, when she was born, the area which is now the Czech Republic was a part of the Austrian empire, however, and Friederike was born into a German-speaking family. After World War I Czechoslovakia was established and the Opava area was included in it. Friederike had to learn the Czech language but did not use it much because she moved to Vienna in 1922, after her parents got divorced. She continued to visit her father in Czechoslovakia until his death in 1928, however. In 1937, Friederike´s first husband sent her to Kenya to investigate whether they could emigrate there. While travelling to Kenya on a steamboat she met P. R. O. Bally who embarked the boat in Egypt: he was traveling via Israel to South Africa but planned to stop in Kenya for a while. Bally, 43 of age then and studying medicinal herbs, invited her to play tennis on board the ship and for a drink. They fell in love but said good bye to each other in Mombasa - Friederike went to visit some Swiss farmers and P. R. O. Bally stayed in Nairobi to study museum collections. After several weeks, Bally, a German-speaking Swiss, came unexpectedly to the Swiss farm and without saying a word he and Friederike fell into each other´s arms. The couple married in early 1938, after Friederike had returned from a trip to Europe to get divorced from her first husband while Bally got divorced from his Swiss wife from whom he was already separated when he met Friederike. Bally gave Friederike a new first name - Joy - because he found the name Friederike too long to pronounce easily and because he said that she was the joy of his life. Joy accompanied Bally on plant hunting expeditions when he became a botanist of the Nairobi museum shortly before their marriage. Their honeymoon was a three-month expedition to the unexplored Chyulu mountains. Other expeditions were to follow. She also made her own trips, usually in the company of other wives of European settlers, both in Kenya and to Uganda and Kongo. She also collected samples for the Nairobi Museum and the British Museum in London. Joy had started to paint as a child (her mother was an amateur painter, too) and had attended painting classes in Vienna where she had studied music and fashion design. While on the expedition to the Chyulu mountains she - encouraged by Bally - started to paint African plants and by 1940 was already an acknowledged painter. In total she made several hundreds of paintings of plants and their flowers. These were exhibited in Kenya and after World War II in 1947 the Royal Horticultural Society in London awarded her a Grenfell gold medal for her paintings. Her paintings of East African plants were published in several books, such as “Gardening in East Efrica”, “Trees and Shrubs of the Uganda Protectorate”, “Trees and Shrubs of East Africa”, “Some Wild Flowers of Kenya”, “The Flora of the Belgian Congo”, and “Kenya Trees, Shrubs and Lianas”. Apart from plants and flowers she also painted animals and native people of Kenya. The Kenyan government commissioned her to make paintings of representatives of indigenous Kenyan tribes and she eventually made some 700 such portraits, documenting traditional dresses and decorations the tribes were using. They were exhibited in the National Museum in Nairobi and in the building of the Kenyan government in Nairobi. Her book “The Peoples of Kenya” was published in 1975 and reprinted in 2003. A collection of Joy´s paintings entitled “Joy Adamson´s Africa” was published in 1972 when her fame was at its peak. Although some of Joy’s paintings were published in her autobiography “The Searching Spirit” and in her other books, a painting of a Euphorbia is not among them, so I have not been able to find out whether Joy painted any Euphorbia at all. However, in “The Searching Spirit” Joy mentions that when she was returning from a trip to Kongo with two female friends, they were driving through a “forest of candelabra-like spurges” somewhere in Western Kenya and she “dug up a couple of offshoots for Peter who was specialising in these plants”. Maybe some of her paintings accompanied P. R. O. Bally´s articles on succulent euphorbias? Needless to say, Bally was an accomplished painter of plants himself - some of his paintings of succulent euphorbias were published in the Euphorbia Journal. Joy´s marriage to P. R. O. Bally did not last very long, however. At a Christmas party in December 1942 the Ballys met George Adamson, a game warden of Irish origin naturalised in Kenya and went on a camel safari with him after Christmas. Joy fell in love with George, but although he fell in love with her too, he did not wish to destroy her marriage to Bally and thus soon invented an excuse to part company with the Ballys. However, after 6 months, he had to visit Nairobi and the first person he met there after parking his car was Joy. As she put it in her book “The Searching Spirit”: “The fate has intervened and it was not long before I was in a divorce proceeding”. Joy and George Adamson married in November 1944. Joy accompanied her husband on anti-poaching patrols and safaris and raised a number of orphaned baby animals. In 1956, George brought her three lion cubs which Joy raised. Two of them had to be sent to the zoo in Rotterdam, the third, Elsa was raised to become independent of humans and released in a national park - she eventually mated with a wild lion and had her own offspring before she died of an infection in 1961. Joy´s book on Elsa was published in 1960 and became very successful and was made into a film in 1966. Joy spent the next two decades touring the world giving talks and raising an orphan cheetah and a leopard, both of whom were successfully reintegrated into the wild, too. In 1980, Joy was murdered by a former employee, whom she had fired for stealing. I would be interested to know whether Joy Bally/Adamson painted any succulent Euphorbia. Perhaps a reader of Euphorbia World has any of the above-mentioned books or has seen her paintings exhibited in Kenya?